Beyond pure experience, the best way for an event planner to become an even better event planner is by attending another function as a guest. Most event planners spend the duration of an event coordinating the behind-the-scenes, but experiencing an event through the eyes of a guest can be, well, eye-opening. Being a guest, rather than the event planner, gives you an opportunity to observe an event operations staff in action, a perspective from which it is often easier to notice what works well -- and what doesn't. Here are three mistakes you'll probably see at poorly managed events, along with tips for avoiding such mistakes at your events. When guests walk up to a registration table, event staff should be welcoming and ready to help guests -- no matter what the situation. It isn't service-oriented or even polite to assume that someone who walks up to the registration table does not belong at the event. Yet, this is exactly what can happen if the staff isn't properly prepared or briefed. Remind the event staff that a registration table represents the image of the host and the organization behind the event. Staff should greet all guests at the registration table and ask if they are there to sign in for the event by the event or host's name. If a mistake has been made, most guests will self-correct and excuse themselves. If not, staff should be given instructions on how to best approach the situation. Kindness goes a long way in event operations. In most venues, housekeeping cleans an event space, and banquet operations staff then complete the setup. If banquet operations drop a glass and fail to clean up the shards, therefore, the shards remain on the floor -- unless event staff cleans up. Shards of broken glass and other debris not only leave a terrible image, but they can also create a safety hazard. Therefore, the best event planners will always arrive 1 to 2 hours prior to the start time to observe the setup and perform a series of walkthroughs of the area and look for glass and other items 30 minutes and again 15 minutes before the event. Should anything be out of place, the event planner can bring it to the banquet staff's attention. With any event, there will be two schedules: the agenda of the organizers and the work schedule of the venue operations staff. It is the event planner's responsibility to make sure that both are appropriately in sync. The program's presentation or keynote will typically occur right after some sort of arrival reception that may include registration tables, food, and beverages. The timing of clean up and tear down activities must, therefore, be carefully planned so as not to interfere with or interrupt the program agenda. When clean and tear down is not discussed with event operations staff ahead of time, an event planner may find that tables and other items may be removed directly in front of hosts or guest speakers, distracting everyone in the room. While well-managed venues with diligent event operations managers and staff should make an event planner's job easier, such perfect event execution is not always the case. Great event planners make every detail of an event execution their business. 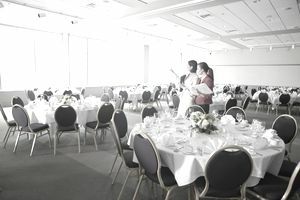 They take the time to discuss all aspects of setup, event service, and tear down with banquet managers prior to the event itself and oversee event operations before, during, and after to ensure the best event possible for the client.